This week we're joined by 2 old school fans, Lee and Jamie, who share their Phish journeys and memories with us. 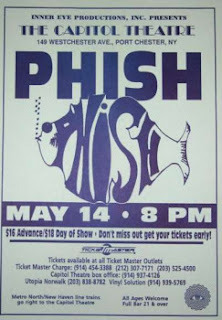 They have been seeing shows since 1990, and we discuss and play a show they were at from the Capitol Theater, 5.14.92. We hope you enjoy this discussion and the music! You can listen to this episode directly here (the setlist is below, and set 1 music starts around 31 minutes and set 2 starts around 1 hour 57 minutes). If you can, please support HF Pod Plus! We appreciate it and hope you enjoy the extra content. Also, take our survey on how Phish has impacted your life. We'll be highlighting some of the initial takeaways in next week's episode. Here are some details on the Bakers' Dozen pre-show events and late night shows. See you all there!